The Parliamentary Elections of June 28 will decide much about the future of Albania. The Democratic Party and the Socialist Party will seek to win the majority of the electorate votes. The new electoral system adopted in December 2008 will make it difficult for a single Party to form the government. The small parties like L.S.I. or the newly-formed G99 will decide who will create the government. Those are both Left Parties but their willingness to collaborate with the Socialist Party if it wins the election will depend on the offers they'll receive to be part of the government. The pre-election polls conducted by Zogby International and the "Gani Bobi" Institute in Pristina show the results being very close. The final result will depend on how the undecided electorate will vote. 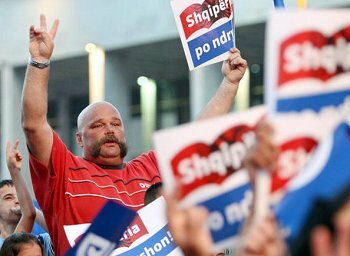 The Democratic Party governing Albania hopes to win its second consecutive mandate. In the last four years a lot has changed in Albania. Not even the parliamentary opposition can deny it. In April the country was accepted into the North Atlantic Treaty Organization (NATO). The reforms undertaken in Albania during the democratic government has been praised by a lot of high officials in the European Union and United States. During the last two years the world has seen a major economic crisis that has put both rich and developing countries into recession. But not Albania. The government has interpreted this as a result of her continuing reforms and good financial work. Last year the G.D.P. growth was 6 percent, according to the International Monetary Fund, and 9.9 percent according to the government. Salaries have increased significantly; more Albanians have jobs then four years ago. The tourists coming in the summer have increased from 300,000 in 2004 to 2.5 million in 2008. The construction of the Rreshen-Kalimash highway is close to completion. It will be the greatest construction project ever made in Albania. All these facts make the Democratic Party confident in winning a second mandate. But there are weak points too. The Gerdeci explosion is difficult to forget. The subsequent events have revealed deep involvement by the government. The May Amnesty International report called it "governmental corruption." The media has revealed the involvement of the prime minister's son Shkelzen Berisha in the affair. The General Prosecutor's Office has been slow in revealing the case. A sexual scandal involving the Minister of Culture made a deep impression in the public. The minister was discharged from office but the image of the government was highly tainted. On the other side, the Socialist Party hopes to win the parliamentary elections after four years in opposition. The major of Tirana and the chairman of the Socialist Party, Edi Rama, pledges radical changes for the country. Not just the way things are in Albania must change, according to Rama, but the way things are thought, have to change as well. He calls to the people to see beyond the left and the right. He talks about old and new politics. Not just new people in politics, but a new way of thinking. His job as city major of Tirana has secured him a good image in these elections. In the eight years as city major, Tirana has changed her face. From a dirty city in the beginning of the 90's, now Tirana is a big, clean European city. In 2004 Rama was awarded the "World Mayor" prize. On October 2005 he was chosen as one of the "European Heroes 2005" by Time Magazine, a tribute to 37 people who were deemed to be changing the world for the better. Based on these facts, Rama hopes to win the elections by promising that the change seen in Tirana will be spread all over the country. But his work has had weak points too. He has constantly been accused of corruption in the granting of construction licenses. Whoever wins the election, it will bring major changes in the country. On one side there are the slow but steady reforms of the Democratic Party. On the other side are the radical changes espoused by the Socialist Party. Ledion Krisafi is a Journalism student at the University of Tirana.